Originally Published in the Outdoor Wire. 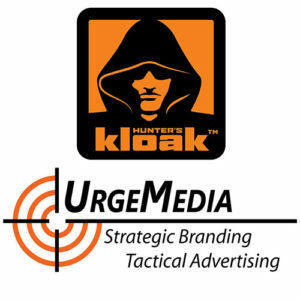 UrgeMedia is pleased to announce a continuing partnership with cutting-edge scent company Hunter’s Kloak. Hunter’s Kloak’s groundbreaking products offer hunters everything necessary to “Hide Your Stink” and attract game in one convenient, hand-held electric cartridge. Their focus on simple to operate, easy to maintain scent dispersal has solved many problems facing modern scent products. Simply hang the patented unit on a nearby tree upwind from your post and eliminate your scent while attracting your trophy buck. Their core product offers interval settings, a rechargeable battery with a micro SD portal, and up to 45 hours of battery life fully charged. With a wide range of scents including acorn, apple, and sugar beet you are bound to find the right attractant for your deer herd. Further, the scents are changeable in the field and the units are water resistant. New for 2018, Hunter’s Kloak is launching the Rut Rouser. This remote-controlled dual scent mist system allows you to switch up your scent and interval settings without relocating to arm’s reach. Hunter’s Kloak began working with UrgeMedia just last year and has reached a dedicated audience of avid hunters across hit shows on the Pursuit Channel, Sportsman Channel, and Outdoor Channel. Their digital marketing efforts through Urge have reached eyes across a variety of social media platforms, websites, and mobile applications. Since 1999, UrgeMedia’s proprietary media acquisition strategy has worked to help outdoor brands big and small reach a core audience across linear television and the digital advertising space. Customized micro-sponsorship plans can be developed to fit any budget. For more on what UrgeMedia can do to benefit your brand, visit www.urgemedia.com or give Clint Salisbury a call at 970.328.8001 ext. 34. This entry was posted in Our Brands, Partners and tagged advertising, branding, digital, digital advertising, digital marketing, hunting, marketing, outdoors, scent control, television, television advertising. Bookmark the permalink.